A not so scary, simple occult Horror. If you�ve already read one of my reviews, you�d know I enjoy a low-budget, independent film occasionally. A film where you already know in advance that the special effects won�t be mindblowing. And also, mostly unknown actors are summoned. That doesn�t mean these films are unwatchable because of the amateurish camerawork. Nor is it that the acting is extremely bad. On the contrary. I�ve already enjoyed such creative, non-mainstream experiments. I also enjoyed �Pyewacket�. A simple horror story (even though you can discuss whether or not it�s a horror) in which black magic and satanism are the cause of a lot of misery. You might have second thoughts about the impulsive behavior of Leah (Nicole Mu�oz) who, after yet another dispute with her mother, goes into the forest and armed with a book about occultism and a few attributes performs an ancient ritual. A ritual to summon the evil spirit Pyewacket who might ensure Leah getting rid of her annoying mother (Laurie Holden). The fact that her mother might go through a difficult emotional phase, isn�t something Leah realizes. Leah being sorry afterward and suddenly noticing that her mother isn�t so bad after all. Well, I can relate to that. Who hasn�t been mad at his parents once, after the umpteenth discussion about random insignificant things? Soon Leah realizes that something dark and threatening is wandering around their cabin in the woods. The film itself isn�t really frightening. There are some apparitions, a scared friend who wants to go home after sleeping over one night and a feeling of threat at certain moments. But you have to be really patient for that. Originality is also a term that doesn�t fit with this film. Once again the teenagers in this movie prefer alternative music with the accompanying black clothes and hairstyle. Archetypes that are often used in such films. The fact that some kind of expert shows up to explain it all and gives occult advice, is also nothing new. The strength of the film is its misleading character. I do like films where you have doubts about the true nature of the event. Is the malignant spirit effectively present? Or is it just a fantasy of Leah? Or is she emotionally unstable so she sees things? 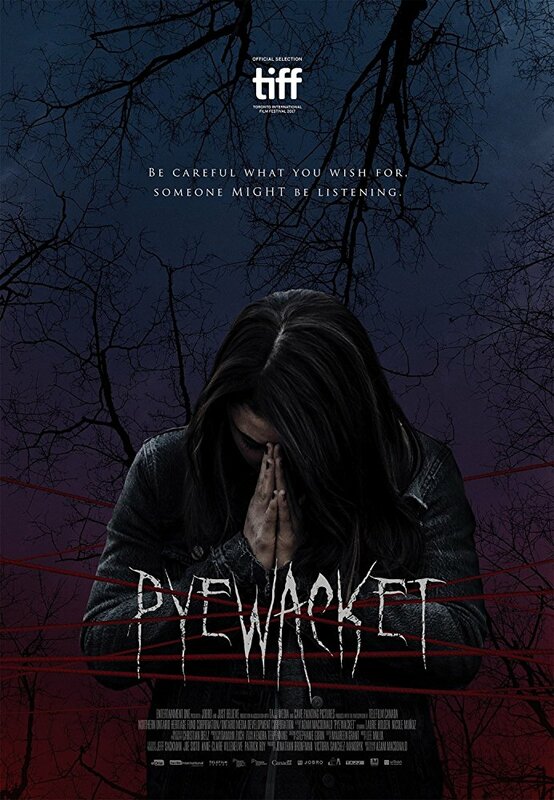 In retrospect, I found that �Pyewacket� was really worth a watch. Not only because of the subject being used. But also because of the sometimes excellent acting of Nicole Mu�oz. And to a lesser extent that of Laurie Holden. Mu�oz her anger and regret felt sincere. More than that of Holden. And despite the fact that the creepy content is of a low level, I thought the dynamic in this movie was extremely successful. No, it�s not an extraordinary movie. The only thing one should remember is never to engage in things one doesn�t know anything about.